It’s been a while since I’ve posted any updates on new things we’ve been trying lately, so I thought I might remedy that today. As I mentioned a couple weeks ago, we moved to a new place this month because we discovered our last apartment had mold (yuck!) and our landlord needed us to vacate to fix it. Oh, the joys of apartment living. Let’s move onto more positive things, shall we? 1. My new favorite gadget. 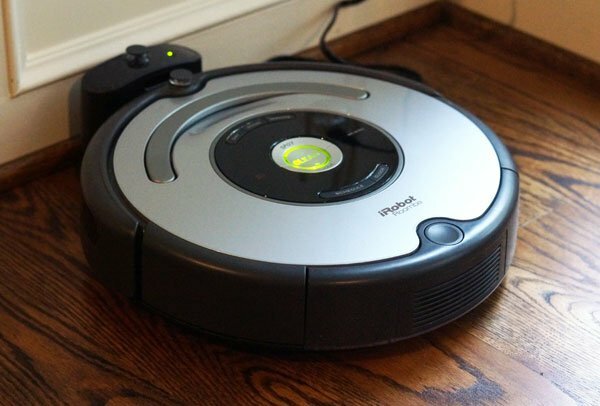 Now that we’re settling into our new home, I took my sister-in-law’s advice and bought a Roomba to help keep it clean. If you’re not familiar with the Roomba, it’s a robot vacuum that can clean on an automated schedule, or on-demand. I’m in LOVE with this thing. Previously, I was lucky if I vacuumed my apartment once a week. Now I have this brilliant robot automatically programmed to clean a room each day and I’ll set it in our bedrooms to clean while we’re out running errands. Whenever we come back, the carpet is covered with fresh vacuum lines! It makes me feel like superwoman, even if I’m not really the one doing the multitasking. 2. My new mattress. If you’ve been reading here for a while, you know that when my husband and I moved halfway across the country to Los Angeles, we carried only the things we could pack in one car. We were broke and had no mattress when we arrived, so we bought the cheapest one we could find and have been sleeping on it for the last 9 years. Since having our baby, and researching the best non-toxic crib mattresses for him (we selected this one), I realized that we were probably due for a new mattress ourselves. We settled on the Classic 8 mattress from Essentia, because I was really impressed with their organic natural memory foam mattresses– like a food label, they share the ingredients they use, along with their independently tested VOC report. In the spirit of full disclosure, I asked the company for a complimentary mattress to try, and I’m glad I did because it feels like I’m sleeping on a cloud. I’ve never slept better in my life! 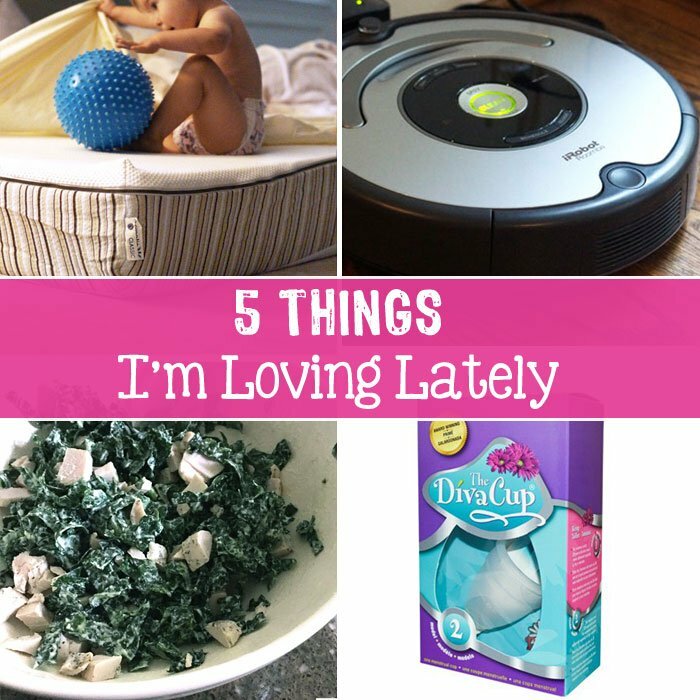 I can’t feel my husband move on the other side of the bed AT ALL– which is great, because we rarely go to bed at the same time– and I also don’t have the need for random pillows under my knees anymore, because the memory foam contours to my body perfectly. It’s truly amazing, and unlike other petroleum-based memory foam mattresses, this one had NO chemical smell when it was fresh out of its packaging. I’ll give you guys another update once we’ve been sleeping on it a bit longer, but so far, so good. 3. The Diva Cup. Ladies, this one is for you. 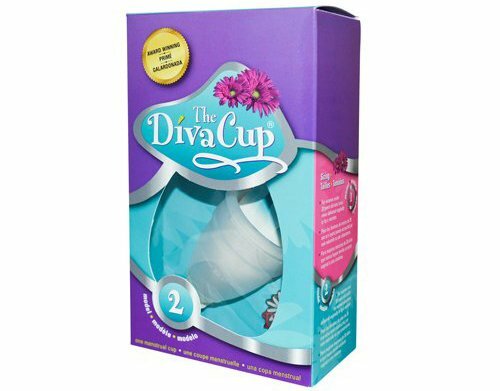 I heard of the Diva Cup years ago, but it sounded so unappealing to me at the time. You stick that little silicone cup, where?!! But hear me out. This thing is LIFE-CHANGING. Yes, there is a little bit of a learning curve. Every friend I know who has tried it has at least one user-error before falling in love with it, but then you learn what you’re doing and you’ll never want to go back to using tampons or maxi pads. Ever. All you do is empty this little cup once in the morning, and once and night. You never have to worry about leaks, and you never have to worry about not having a tampon or pad on hand– because this silicone cup is reusable, and can last up to 10 years! I actually forget my period now. It’s that unnoticeable. 4. Infused olive oils can do amazing things. I make the vegan Caesar Salad dressing from my cookbook at least twice a month, because it is my very FAVORITE dip for pizza. Plus, it makes me eat salad even when I don’t necessarily want to eat salad. Oh boy, did that change things. 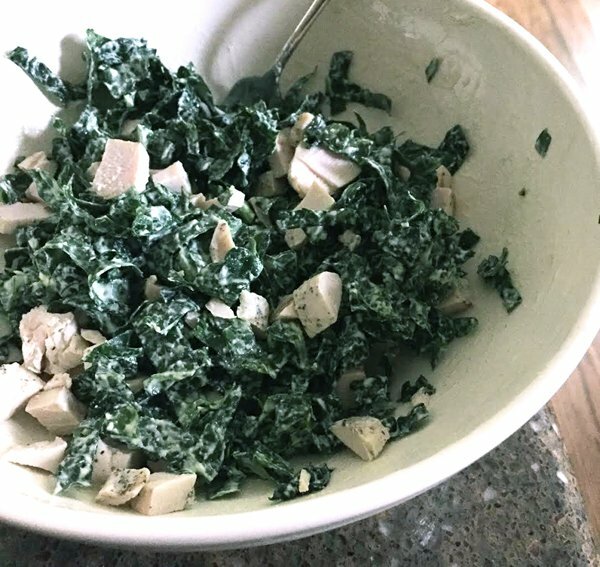 This particular Caesar dressing was the best batch I’ve ever made, and it even tasted good over kale, which is not always my favorite salad green. If you have access to rosemary-infused olive oil, get some ASAP and try this variation! 5. It’s that time of the year again. The holidays can become a slippery slope when it comes to healthy eating, and this hectic month has had me eating more sweets than I care to admit. I mean, who isn’t going to eat a few extra pieces of candy on Halloween? 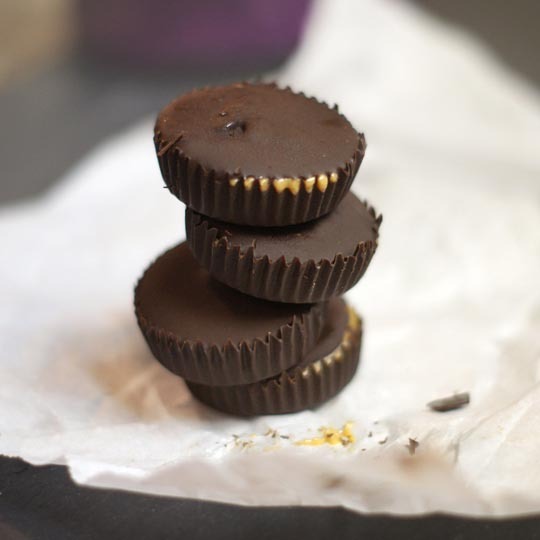 I know I will be indulging in my fair share of peanut butter cups. That’s why I’ll be opening up registration for my Warm & Cozy Winter Detox Program again this weekend, starting on October 31st, for those of you who might want some accountability between Halloween and Thanksgiving. This 21-day program will be revamped to give you even more community support, so registration for the November session will close on November 5th (the last day you can start and still finish in time for Thanksgiving). 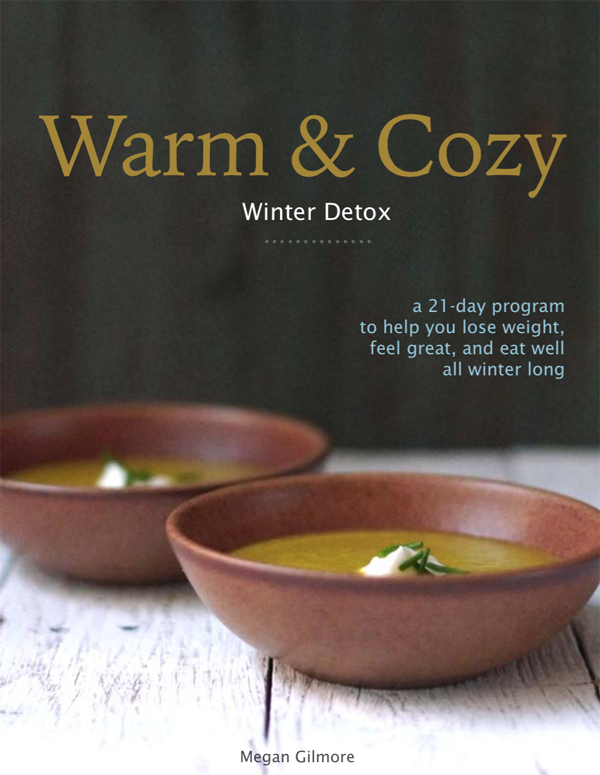 If you haven’t signed up for my newsletter yet, be sure to do so and check the box next to “detox programs” so that I know you want to hear more. I’ll be offering a special discount for my email subscribers this weekend, along with one for those who purchased the program last year. Reader Feedback: Have you tried anything new lately? Please do share! I am loving Roomba too. Now my room is always clean. Good to know that you love your Essentia mattress! I have one of their pillows and love it. We’ve been wanting to purchase a mattress, but it is a big investment! I bought Essentia mattress for my daughter and it’s amazing. I picked up the cheapest ove for her and we both love it. I’m planning to get one for myself within a couple of years as well as they are really comfortable. The company had regular sales on so sign up for their newsletter. Free shipping to US and Canada on to of it. I am wondering which essential mattress you got, they have several, thanks for the post. I have been looking for a new organic materials mattress and this was helpful. I got the Classic 8. It’s really wonderful! You are making me so thankful that I live in an area where big homes are so affordable. I have a few close friends who live in Long Island who think a 1100 is huge! Where I live, under 2000 square feet of living space is considered quite tiny, ha. Many peoples homes are in the 3000-5000 square foot range. It’s all about perspective, isn’t it! You are making me want a roomba desperately as most of my house is hardwood. I will ask for one from my husband for Christmas!!! I love(d) my DivaCup until I didn’t (I even did a post on it: http://crunchyhotmama.com/2012/04/03/the-divacup/). It worked beautifully after I had my first but isn’t working after my second (1st was a C, 2nd was a VBAC). I’m so mad that it doesn’t stay in anymore and even bought a Luna Cup to see if that would help…nope 🙁 Oh well, I’ll keep my Luna in as long as possible because I refuse to go back to tampons. Must look into that mattress!! Oh man, I thought maybe it was just me!! Since having my little one (3 years ago) I maybe can sort of wear my Diva Cup for one day of my period, but I always feel it still. I thought maybe if I bought the other size it would work. I used to LOVE it! !